Wedding Day Diamond Advice from Minneapolis's Premier Diamond Jeweler. So we asked the advice of a Minneapolis Jeweler on the topic of some very common questions when it comes to buying a wedding ring. Gittelson Jewelers "Diamonds in the Skyway" has been a downtown Minneapolis staple for over 30 years. Read their answers to some common Wedding Day Diamond questions. 1. As a premiere wedding jeweler, what are you seeing as the top 3 trends for the upcoming 2015 wedding season for engagement ring styles? As jewelers, we see the bridal industry having three major engagement ring trends for the upcoming 2015 wedding season. The first is vintage-inspired engagement rings. Vintage inspired rings are based off engagement rings of the 1920’s, 30’s and 40’s. The rings feature mil-grain, elaborate engraving, and north-south prongs - just to name a few distinguishing characteristics. The second trend is engagement rings in yellow and rose gold. Rose gold especially has been increasingly popular. A mix of white and rose gold is a beautiful way to mix modern and vintage in engagement rings for 2015. 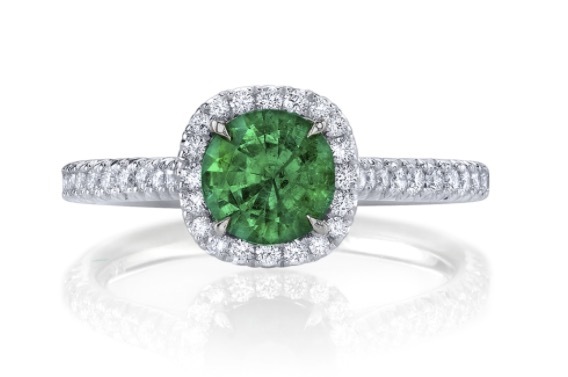 The third trend is the use of gemstones in engagement rings. Many brides are using sapphires, emeralds and rubies to play up their center diamond and to add a unique flair to their ring. 2. We all know diamonds are a girl's best friend, but bigger isn’t always better. What advice can you give to couples who are looking to get the best bang for their buck? When it comes to choosing an engagement ring, it is always great to have a budget in mind whether your spending $1,000 or $25,000. Now more than ever, there are beautiful options for couples working with a smaller budget. My advice is to take advantage of diamond halo-style engagement rings that circles your center diamond (or gemstone) and make it appear as big and as bright as possible. Don’t love halos? Make your engagement ring your own by utilizing gemstones or rose gold to give it a little something extra. 3. In your expert opinion... when selecting a ring for the bride, what are the clarity and quality selections that you should stick to? Color, cut and clarity of a diamond are just as important as carat weight. Ultimately, Its about finding a balance of all the factors in consideration of your budget in order to find the best ring for you. One question you should be aware of regardless of the grading is – does this diamond sparkle? The answer should always be YES! Many couples find brilliant sparkle in small packages that stand apart in a room full of larger rings with poor color and clarity. You'd be surprised how many heads you can turn when you find a jeweler that is concerned with your budget, understands your needs and works hard to source the best possible solution within your Wedding Day Diamond criteria. 4. What is the proper etiquette for placement of the wedding band with the engagement ring? Should the wedding band be worn on top of or below the engagement ring? Traditionally, the wedding band is worn ‘closest to the heart’ and on the inner side of your engagement ring. Of course, many brides are non-traditional these days and wear the wedding band on the other hand or on the opposite side of the engagement ring. Just do what you love and your rings will shine! 5. At what milestones do you typically see couples upgrading their wedding rings? Often times we see married couples upgrading their diamond or their wedding bands at the 5, 10 or 25 year mark. But of course there is no written rule that these years are the ONLY time to upgrade. Some couples love to add a wedding band or upgrade the center stone after the birth of their first child. Some wait until they get that promotion they were working towards or their first wedding anniversary. The short answer is, upgrading can happen anytime and is a meaningful way to acknowledge milestones in your relationship. 6. The cut of the diamond; how does that differ from shape? How does one choose the “right” shape? What are the classics? Cut and shape of a diamond are two different things. A diamond’s shape describes the physical shape of the diamond (round, princess, cushion etc.) The cut is a measurement of how well the diamond became the shape it is. For example, a princess cut diamond is graded a “very good” cut. Princess is the shape and very good is the cut describing the diamond. 7. Is there any other professional advice or tips that Gittelson Jewelers can give to brides & grooms-to-be? Being in the bridal business for over 30 years, we have seen our fair share of engagements! We encourage all soon-to-be brides and grooms to be open and communicative during this time. Whether discussing what type of ring SHE loves or what budget HE feels comfortable with, open communication will ensure that both couples receive what they are looking for during the ring purchasing process. Pro Tip: We strongly advise that all couple’s speak directly with a jeweler when making both a life-changing and financial investment of this magnitude. It is very helpful to try on rings and view a diamond in person to determine what is best for you and your fiancé. Gittleson Jewelers was recently featured by Jamie Yuccas on WCCO | CBS Local's "Minnesotan to Meet" segment. Want More Wedding Day Advice?